The Traverse Double Buckle Belt (model no. 59510) is designed for both casual and duty wear, offering superior design, great looks, comfort and the rigidity enough to hold sidearm and holster without twisting. This features lightweight, two-tone buckles made of anodized aluminum and a reinforced belt tip. 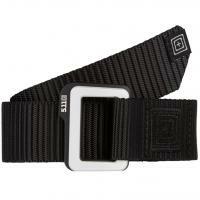 The belt itself is made of ribbed and woven nylon for extra strength and has a 1x1 inch loop patch on the front. It comes in four colors (black, brown, tan and gray) and five sizes (small to double extra large) to offer the best fit and look to match your uniform or kit.